Scientists and engineers deploy the 15-foot-tall buoy during testing prior to its deployment off the Washington coast. The buoy will be about 15 miles off the coast from La Push. A UW-built Seaglider will operate in nearby waters. 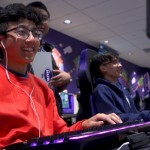 Together they will monitor such things as carbon dioxide-rich waters off the coast, which typically end up in Puget Sound, as well as the waters of the Juan de Fuca eddy, a place where toxic algal cells concentrate. 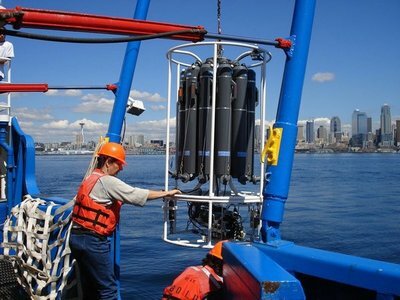 Jan Newton, oceanographer with the UW’s Applied Physics Laboratory, helps with instruments that measure such things as salinity and temperature in Puget Sound. 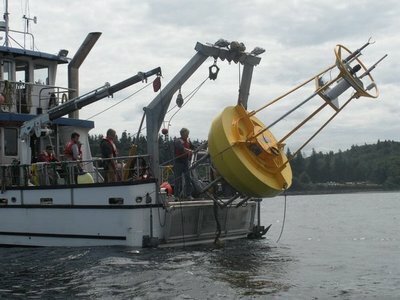 The most sophisticated array of instruments ever put in Washington waters has been mounted on a buoy and Seaglider that will be deployed this week off the coast near La Push, in water that typically makes its way into Puget Sound, according to Jan Newton, an oceanographer with the University of Washington’s Applied Physics Laboratory and lead scientist for the project. 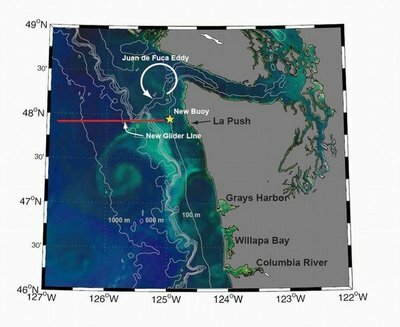 Coastal water conditions are of interest to scientists trying to determine the ocean and weather conditions that lead to such things as water with lower than normal pH — often called acidified waters — as well as the creation of low-oxygen waters, like those that have plagued Hood Canal in recent years. If, for example, we learn more about the conditions that circulate low pH waters into Puget Sound, then oyster growers may one day have a way to judge when acidified waters are present and choose to wait to plant young oysters, Newton says. The array will be about 15 miles off the coast, moored in about 300 feet of water. A UW-built Seaglider will operate in nearby waters, continuously diving and surfacing to relay data. The two will collect data on such things as the weather, sunlight and water conditions — ranging from how much carbon dioxide is dissolved in the water to how much phytoplankton grow. After deployment, data from the array will be available online at www.nanoos.org/nvs/nvs.php, along with readings from dozens of other sensors and instruments that are part of the Northwest Association of Networked Ocean Observing Systems directed by the UW’s Applied Physics Laboratory with NOAA funding. 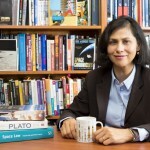 Co-principal investigators with Newton on the project are APL oceanographer Matthew Alford, who was responsible for the initial concept, design, build, deployment and maintenance of the system, and oceanography’s Allan Devol, who assisted with the design and types of sensors to be used. The array and Seaglider are funded with about $500,000 from the M. J. Murdock Charitable Trust and approximately $200,000 in matching funds from the UW’s Applied Physics Laboratory, provost’s office and the former College of Ocean and Fishery Sciences.